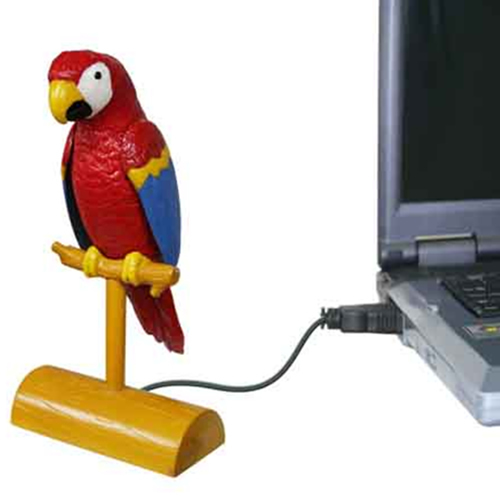 Parrot Forum • View topic - Electronic toys: does anyone use them? Electronic toys: does anyone use them? The >>> is really going to town! Does anyone use toddler noisemakers? What would be the guidelines to ensure safety? Re: Electronic toys: does anyone use them? I definitely think electronic -- heck, even robotic -- toys will be more prevalent in the future for birds to play with. I think that the lady's comment "This is going to drive you up the wall, wont it Einstein?" is pretty apt. I guess its like mirrors. Depending on a bird's reaction, an electronic toy like this could either entertain or torment a parrot. I was worried when I saw that this >>> had plucking issue but I was reassured by the comments section. Einstein's feathers have happily all grown back in. I don't see any harm in letting your bird have one of these musical type toys. It would give the bird something different to interact with. As far as being annoying, it's just like anything, used in moderation it would be fine. These toys are OK when supervised like on Truman's tree. But DON'T PUT THEM IN THE CAGE!!!!! They have batteries, metalic parts, and who knows what else inside! Just because they are baby proof does NOT mean they are safe for parrots unattended. Babies don't have beaks with hundreds of pounds of crushing power. Truman chewed one of the buttons off like it was nothing. A baby may be safe from what's inside but a parrot may tear the insides out and get hurt so please do not leave a parrot unattended with this kinda stuff. I also only hang it on the playtree, not in the cage.. Sometimes they'te really aggressive on the toy and I don't want they begin to fight with each other.. I really don't use electronic toys but after watching your videos i am greatly inclined using them soon. Yet further evidence that parrots are mentally toddlers. The same things delight them. Apparently electronic toys are Fuzzybutt's favorites. I feel really sorry for Fuzzybutt ! He/she must have had a hard life before being adopted by these kind people. I bought an electronic parrot toy for my son,He really like it.